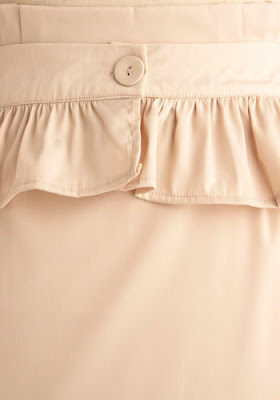 Reader request: Ruffled peplum skirt tutorial! A while ago a reader wrote to me and asked if I could do a tutorial on how to make a skirt like this one, the "Full of Pep-lum" skirt from ModCloth. It is darling! 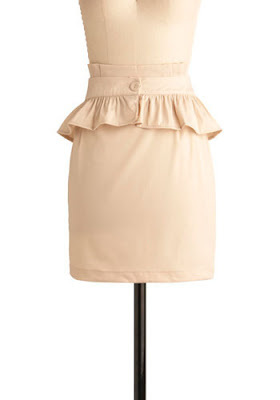 It's actually a skirt with a detachable ruffled peplum belt. It is a lot of fun! I gave it some thought for a few days... and then I also saw it in a wardrobe board from the great blog What Would Emma Pillsbury Wear?. Cut out the skirt front and backs, making it your preferred shorter length (ModCloth tells us that the skirt is 18"-19" long). Also cut a waistband, 1.5" longer than your waist (1/2" seam allowances, plus 1/2" wearing ease). Make the piece 3"-4" wide, depending on the width you want. Assemble the skirt as per the pattern instructions, zipper and all, except instead of the facing or lining or whatever you'll add your waistband. INSTEAD of making darts in the skirt, turn them into pleats. Use the lines where the pattern marks for darts, just pleat them and don't sew them down instead. Here's how I cut them out--you'll want them about 1 1/2" times the circumference of your waist, so they gather the right amount. Here's my approximately 40" long pieces... and, yes, just cut the bottom ruffle, the one that gets wider at the back, by eyeballing it. Also cut out a waistband! Cut two pieces, again 1 1/2" longer than your waist is around. Hem the top of your top ruffle and the bottom of your bottom ruffle. Sew a row of looong gathering stitches on the unhemmed sides of your ruffles. Right sides together, sew your ruffled onto one piece of waistband. Then, sew the lining/underside of the waistband right side to wrong side of ruffle to cover the raw edges. Uh oh... here's where the pictures stop. Sorry. Now you should have a closed tube of a waistband, with your ruffles inside. Turn it right side out and press as best as you can. Top-stitch 1/4" or less from the top and bottom edges of the waistband piece, keeping your seam allowance in place. Close the short ends of the waistband by pressing and turning, and top-stitching them as well. Chose a closure, and install it. The ModCloth version has a button and buttonhole, but I didn't have any big buttons so I did hooks and eyes. Add another belt if you like! I may make another one of a nicer fabric... maybe a variation on the belt, like a pleated peplum?? So cute, so many ideas! What do you think? And, what could I pair with it to make it more office-ey and professional? I think with a nice blouse you could make it office-y enough for work. Nice job, I think it's very cute! I love it! Thanks for the tutorial. I think that if you use it with a classic white shirt and some black shoes it would be great for the office. Oh my goodness I was so excited when you posted this!! Thank you so much! and thank you for being so nice with your email (and humoring me by doing the tutorial!) It came out so cute! it's a great ruffled belt idea! To me it looks like the top ruffle of the ModCloth is actually part of the skirt rather than the peplum, but I think I like your version better! =) Probably will stay in place better too! I love this. I am featuring this at somedaycrafts.blogspot.com. Thanks for the submittal. @Anonymous, yeah, I totally forgot to say that part--in the original, there is a ruffle on the skirt, but for me it was a lot easier to just do a plain waistband on the skirt and put both ruffles on the belt! Wow. Awesome tutorial. Thanks so much! Definitely on my to make soon list. Our readers love your site. Thanks! could you give me some advice on how to make a hemisphere-like peplum instead of a ruffles peplum? I have been trying to play around the darts but it seems like the peplum cant 'stand' like a hemisphere, it keeps dropping down. Could you advice me on the material as well? @Keiv, hmmm, what do you mean by a hemisphere peplum? As for materials, you'll need something with a little stiffness to it. I recommend a sturdy cotton twill or other bottomweight. I found you through All Free Sewing and the timing could not be better. I have a bunch of leftover taffeta that I will be using to make a skirt and this looks like it will be perfect to complete the outfit and the look! Perfect, glad you found me! Hi! Just found you and immediately start following!! Amazing blog and tutorials! Have a nice day and Happy DIY!